One of TAG Hardware’s hottest-selling products of 2018 has been our ELITE shoe fences. Late last year, we introduced corner posts for shoe fences, and we’ve had a lot of questions as to how to design with them. We’ll talk about shoe fence applications that we’ve seen (and some cool ideas that we haven’t seen yet…), how to design effectively with corner posts, and how to get them installed cleanly and efficiently to bring your designs to life. It’s probably not going to come as a huge shock that our ELITE Shoe Fences work great for framing shoe shelves. 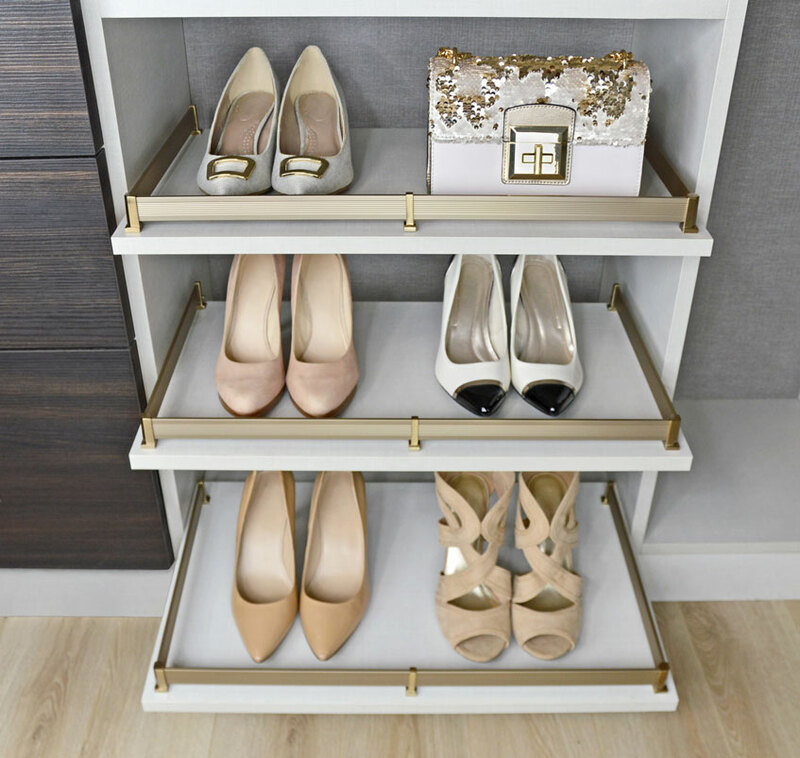 However, the addition of corner posts allows you to frame pull-out shoe shelves on either three sides or four sides, adding functional (shoes won’t slide off the sides or back when the shelf slides out quickly) as well as aesthetic benefits (the metals coordinate perfectly with closet poles, pull-out accessories, and decorative handles). Some of the most potentially frustrating and often unattractive pieces of a walk-in closet are the corners that link two sections. Shelves can add valuable storage space to make the corners useful, and using corner posts on the inside 90-degree corner allows you to frame these shelves like you would with shoe ­shelves elsewhere in the closet. Neatly framed corners bring unity to the design and link sections together. Here’s a great example from Whitney Hahn from Charlotte, North Carolina – a set of four framed shelves using corner posts on the inside corners, with angled shoe shelves in the adjacent section. Whitney used matte aluminum fences with polished chrome posts for this design, and we think it looks fantastic! Zig-zag or chevron patterns – in a world of straight lines, why not zag when others zig? 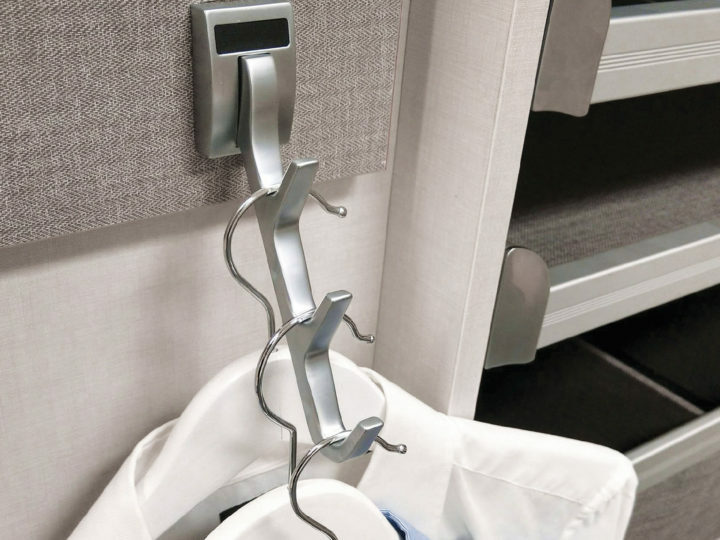 Using the corner posts to create 90-degree connections lets you build in a zig-zag pattern to create unique storage spaces. Fence a floating shelf or the top of a piece of furniture – if the top of the piece of furniture is thick, you’ll need to get creative and source longer screws (#8, 5/32” diameter is what you’ll want), but you could fence the top of any bookcase, floating shelf, bar top, etc. 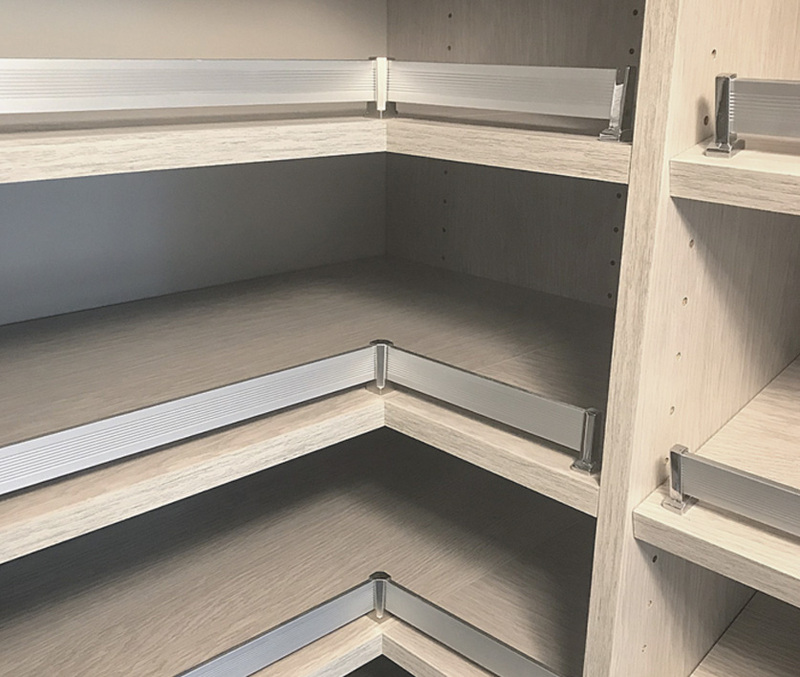 If you’re installing cabinetry in an RV or on a yacht, ELITE shoe fences could be an elegant way to keep pieces contained on shelves where they belong. 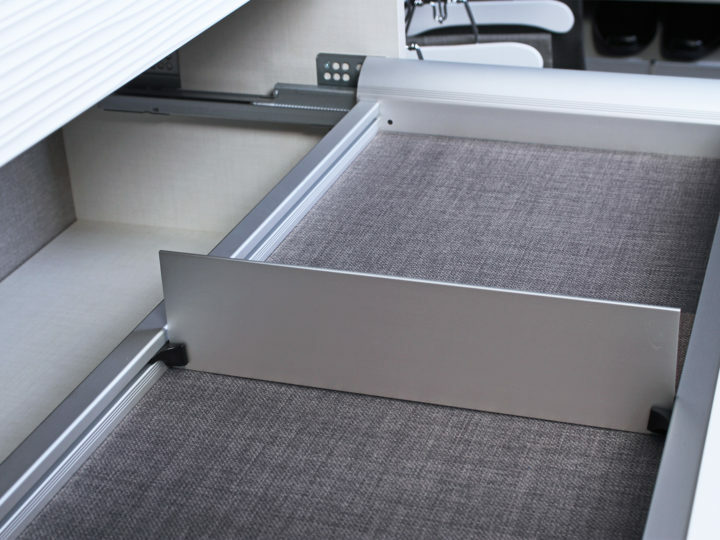 Underside of a shelf – unless you are able to defy gravity, this would be purely decorative. ELITE shoe fences have lots of great decorative and functional applications right out of the box, and the addition of corner posts lets you explore new options and develop creative new designs sure to wow your clients. Actually installing ELITE shoe fences is straightforward, and there’s only one extra step needed when you’re installing corner posts. 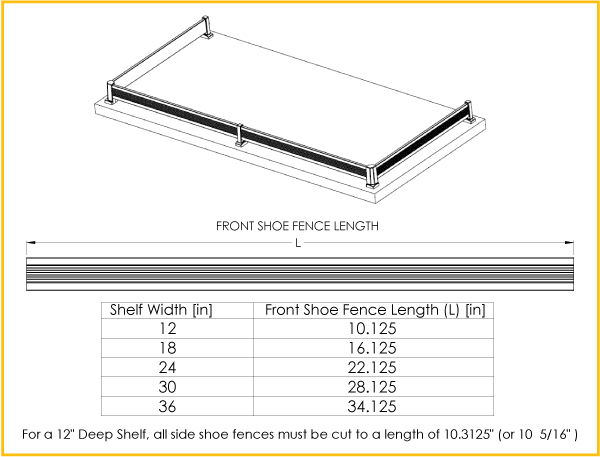 ELITE shoe fences are available in kits with pre-cut lengths of fence that work for standard closet section widths (18, 24, 30, and 36”). 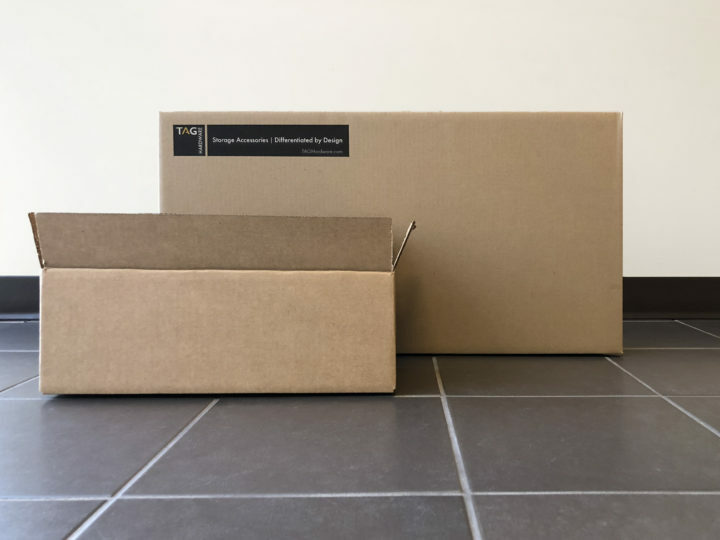 To install a standard shoe fence, just measure ¾” in from the corner (both width and depth-wise), and the shoe fence will be exactly that length – each fence section is actually 1 ½” less than the section width. Drill a 5mm diameter hole, and the included #8 machine screw will mount the posts. Longer shoe fences will also have center posts (or centre posts, as we spell it here in Canada), so you’ll have to find the centre of the shelf to mount that post. The ELITE corner posts are a different shape than the end posts, and while these install in the same position (3/4” from a corner), the shoe fence sits inside the post differently, so the fence needs to be cut so it’s slightly shorter. 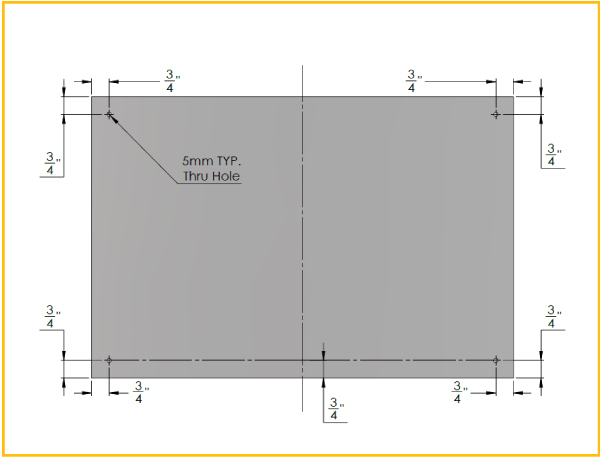 For example, a 24” shelf would have a shoe fence length of 22 1/8” using corner posts vs 22 ½” using end posts. Just keep this in mind when installing the fences in corner posts – you’ll need to cut the lengths down slightly. Another option if you’re planning to install a lot of shoe fences is that you can purchase 93” lengths of fence, end posts, centre posts, and corner posts separately, and just cut and build what you need on site. Our recommendation is to build fences ¾” in from the corners and edges, but you can build however you like – the only limit is your imagination. And physics, so there really are two limits – your imagination, and physical reality. Hope this has given you some ideas and insights as to what corner posts can do for your designs with ELITE shoe fences. Please share your designs with us; love to see what you’re creating!